This topic contains 6 replies, has 3 voices, and was last updated by DruggedBunny 5 months ago. Collect gems and escape with the orb through the portal to next level! There are 6 or 7 semi-random levels (nice colours, basically), followed by infinite random levels (horrific colours). Last gem spawns the orb at present, try collect near top of orb — to be fixed to spawn on pickup point. Uses mojo3d, physics, various language features. For what it’s worth, lots of updates! Date: Wed Sep 19 02:58:17 2018 +0100 Preloads all audio Date: Wed Sep 19 01:14:40 2018 +0100 Preloads sounds (few more to-do) Cleans up SpaceGem spawning, which was stupid Turns remaining physics objects to full Behaviours (todo: Rocket) Removes redundant refs to Model/RigidBody in Behaviours (may be some remaining! ), can just return Entity/GetComponent <RigidBody> instead Removes misc redundant fields, properties, etc and makes more stuff Private Fixes level naming for randomly-generated levels Rearranges some level init stuff and fixes removal of gems/pads post-conversion to Behaviours Date: Sat Sep 15 02:38:12 2018 +0100 Converted PhysicsTri to Behaviour; auto-fades/removes each triangle now Date: Sat Sep 15 00:34:44 2018 +0100 Converts Portal to Behaviour-based object Date: Thu Sep 13 04:43:53 2018 +0100 Converts Orb, SpaceGem and SmokeParticle to pure Behaviours Fixes to DummyOrb Date: Wed Sep 12 02:36:04 2018 +0100 Adds dummy orb light (late TODO: Add portal ground light?) Date: Wed Sep 12 01:23:13 2018 +0100 Updates to readme again Date: Wed Sep 12 01:21:21 2018 +0100 Updates readme. Date: Wed Sep 12 01:15:24 2018 +0100 Added screenshots Date: Wed Sep 12 00:53:36 2018 +0100 Fixed remaining orb channel error (played boom on level exit) Date: Wed Sep 12 00:45:49 2018 +0100 FFS! Disabled temp portal collision visibility Date: Wed Sep 12 00:44:56 2018 +0100 Forgot to reset temp orb spawning Date: Wed Sep 12 00:42:33 2018 +0100 Fixes orb and portal respawning Fixes orb audio silence after first explosion Date: Tue Sep 11 02:24:39 2018 +0100 Portal fixes WIP -- currently semi-broken! Date: Fri Sep 7 01:08:17 2018 +0100 Dummy orb now basically spawns above player start point. WIP. Date: Thu Sep 6 05:07:16 2018 +0100 Adds terrain smoothing via Gaussian blur. WIP DummyOrb for spawning physics Orb. Portal fixes WIP -- currently semi-broken! Dummy orb now basically spawns above player start point. WIP. Adds terrain smoothing via Gaussian blur. WIP DummyOrb for spawning physics Orb. Main plan is to a) implement PAUSE (scared of this because I’m not sure how the physics engine will handle it! ), and b) allow clicking of in-game objects to spawn text about where they’re implemented and how. One thing I will say though; it’s sometimes hard to figure out where the “space gems” are. A pointer or some sort of radar would be a big help. And another thing I noticed! I have a 144hz monitor, that means games should ideally run at 144 FPS for me. Your game however seems limited to 72 FPS? How are you timing the frames? Other than that, good work! Thanks for having a look… the camera definitely struggles in close-up, but it’s surprisingly tricky to resolve. Yeah, I’ll be adding a gem map at some point, should be really easy. Hard-going for me, but this is probably the longest I’ve stuck at a single project! It’ll never be a great game, but I’m learning a lot and once it’s at least working fully I intend to document it to explain its workings, how it uses the language/engine features, etc. Just updated this, along with a binary release for Windows 64-bit. Done quite a lot since last post, chunky explosions with rocket parts being possibly the coolest. Some basic pixel shaders, too. The release doesn’t really mean anything in particular, still tons to be done/tweaked, just testing out GitHub’s release option. NB. Undocumented Pause feature (key P) currently broken due to recent addition of delta-timing for non-physics stuff. Use R to reset! Date: Sun Oct 21 21:32:13 2018 +0100 Misc fixes, HUD and RocketParticle changes. Fixes public Behaviour stuff that should have been private. Orb is easier to collect now that IT HAS A NON-ZERO COLLISION RADIUS! HUD is now a proper object with methods, rather than a collection of public functions. HUD death-skull is finally a sprite! Should (SHOULD) now appear in VR, yet to test... Smoke is now more dynamic; clears up quicker and rises. May need to be changed to an option for performance, dunno yet. Date: Sat Oct 20 20:36:22 2018 +0100 Adds monochrome (B&W stippled) shader Reverts to sprites for rocket particles -- thanks to Mark for fix! Date: Fri Oct 19 16:25:22 2018 +0100 Many changes, slightly hesitant commit! 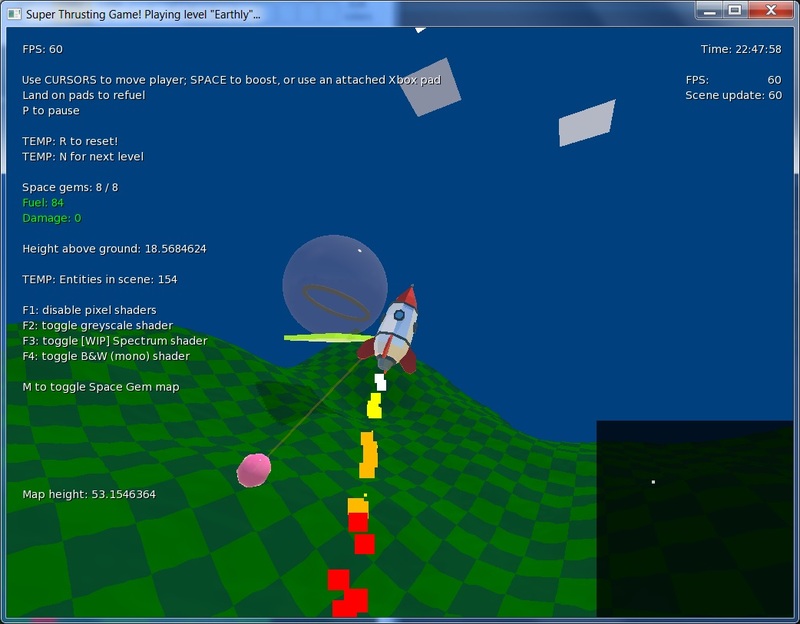 WIP rocket particles (sprite and quad) changed back to cubes temporarily, due to problems with sprites and quads, as noted here: https://github.com/blitz-research/monkey2/issues/434 https://github.com/blitz-research/monkey2/issues/436 Removes redundant properties from Level. Attempts to make lots of non-physics stuff framerate-independent via delta timing... possibly. (Not overly sure what I'm doing here.) Disables Xbox pad if keyboard used. (Per-frame.) Adds explosion particles. Date: Wed Oct 10 03:46:14 2018 +0100 Chunkier crashes! Definite WIP, may crash (seems OK so far but only tested on supplied rocket and in-game orb). TODO: Explosions... Date: Sat Oct 6 23:33:20 2018 +0100 Adds pixel shaders -- greyscale and ZX Spectrum palette (TODO: attribute clash) Adds gem map (TODO: add orb and portal) SmokeParticles are now sprites Date: Sun Sep 30 14:57:35 2018 +0100 Starts conversion of SmokeParticle to sprites, but [mojo3d sprite alpha appears to be broken at present] (https://github.com/blitz-research/monkey2/issues/410#issuecomment-425720114) Adds simple greyscale shader (press G to cycle through modes), just to provide a base for experimentation. Darkened sky to allow for better greyscale contrast. Misc fixes, HUD and RocketParticle changes. Fixes public Behaviour stuff that should have been private. Orb is easier to collect now that IT HAS A NON-ZERO COLLISION RADIUS! HUD is now a proper object with methods, rather than a collection of public functions. Smoke is now more dynamic; clears up quicker and rises. May need to be changed to an option for performance, dunno yet. Reverts to sprites for rocket particles -- thanks to Mark for fix! Many changes, slightly hesitant commit! Removes redundant properties from Level. Adds simple greyscale shader (press G to cycle through modes), just to provide a base for experimentation. Darkened sky to allow for better greyscale contrast. Collect all Space Gems to spawn the Atomic Orb, which appears at your start point. Refuel by landing on pads. Still lots of problems (frame timing on non-60 fps systems in particular), VR broken, all still very WIP! Use an Xbox pad if at all possible! Game will use the first one it finds attached.